By LUDWIG VON KOOPA - Featuring: The day after Halloween. A day in the life of Ludwig: Well, a special day. After spending Halloween playing Splatoon to support the victorious Team Pirates in Splatfest, I needed to obtain the $10 eShop gift card that was the prize of Round 4 of the KoopaTV Loyalty Rewards Program. You know, for our lustrous winner ShinyGirafarig. I also wanted to finally get Yoshi's Woolly World after having such a warm, snuggly article for its launch. So it sounds like what I needed to do was go to a videogame store. Well, let's go to my reoccurring local Best Buy! 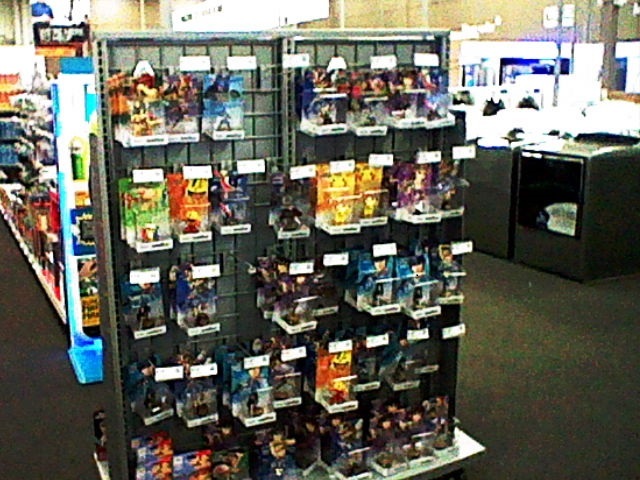 This time we have a ton of Captain Olimar & Pikmin amiibo. Yoshi's Woolly World with the included yarn Yoshi amiibo ($60 bundle) wasn't on the shelf, so I had to ask for it from the back-room. And it was there! But while I was waiting for the Best Buy rep, I was wondering around the store. I figured out that promising a $10 Xbox Live code or a $10 PlayStation Store code could be... bad ideas, as I teased yesterday. There was no $10 Xbox Live code in the store. The lowest denomination was $25. There were $10 PlayStation Store codes, but they were in a set of 3 that were $30 total. There was also, like, 1 of them at the front of the store instead of near all the PlayStation stuff. Not very reliable. Meanwhile, Nintendo's eShop cards had plenty of $10 denominations in both weird AR card forms I don't trust, and just the code. It turns out the back of the shelf has a ton of amiibo! Well, I found out this back of the shelf existed by total accident. 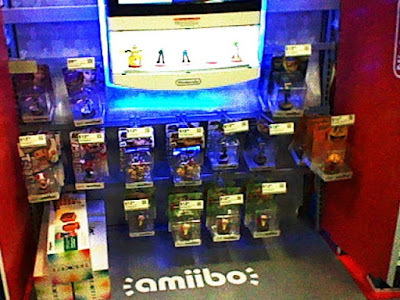 In terms of amiibo, on that shelf there were King Dad, Captain Falcon, Lucario, many Dark Pit, Greninja, Captain Olimar, Pac-Man, Ganondorf, Pikachu, Zelda, Fox, Marth, Zero Suit Samus, pixelated blocky plumber, and Little Mac. I wish Little Mac was there a while ago when I was going out looking for him, but whatever. Let's zoom in a bit. Ganondorf amiibo are pretty cool. They're basically action figures. 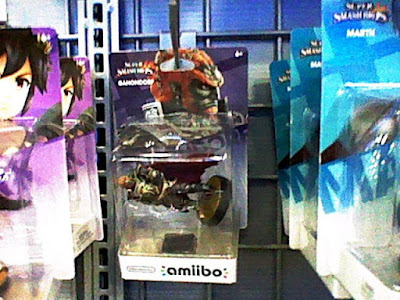 Well, the two Ganondorf amiibo present weren't... purchasable. I'll show you. And this Ganondorf amiibo has... a posture problem. To put it optimistically. Well, the Best Buy guy was taking so much time getting Yoshi's Woolly World with the yarn Yoshi amiibo that I decided to lose control over my life and buy a Lucario amiibo. I've always liked Lucario. He's part of my favourite Pokémon generation, and I tried fourth-ing him in Super Smash Bros. Brawl and I'm, like, fifth-ing him in Super Smash Bros. For Wii U. But I remembered my article about how the Lucario amiibo doesn't have compatibility with Yoshi's Woolly World because The Pokémon Company is isolationist. 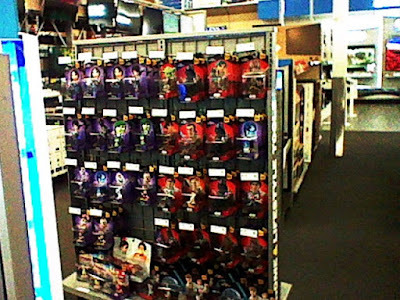 So I was looking at how many Dark Pit amiibo there were and wondered, "Why the hell are there so many Dark Pit amiibo? Who is going to buy any of those? He's a pretty much irrelevant side character." So I actually felt bad for Dark Pit and decided to get his amiibo. 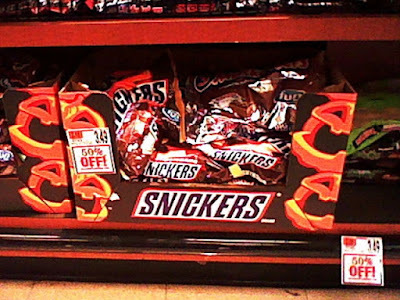 So I decided to follow-up on my statement in my Halloween article, "Rather than go around and take razor-blade-embedded candy from strangers, you can buy non-tampered candy for 75% off at the store the very next day." 50% off (could be 75% somewhere else)! Like clockwork. Or that's what I'd say if the clocks worked. And then I visited McDonalds. You know, they have a Nintendo Zone there. I guess Best Buy also does! When I came home, I had 15 StreetPasses, all from out-of-area! That's thanks to National StreetPass Weekend that happened last weekend. With that, I got to complete a substantial portion of the Yo-Kai Watch Puzzle Swap thing in StreetPass Mii Plaza! Yiippee. a Dark Pit amiibo, and a Lucario amiibo. Basically, I've lost self-control. I was the person who, less than half a year ago, adamantly was refusing to buy a $12 domain name. And now I just splurged a substantial amount of money in one day over impulse decisions. Someone, help me. Please. I need help. Ludwig is showing his vulnerabilities to the readers. Does this make him a more relatable author? Give him feedback! ...And also help him, because he really needs it before he falls apart and goes from a Koopa into some sort of invertebrate slug. Ludwig wants to get control over his life, so he'll reject pseudo-gambling. Ludwig talks more about his discounted candy-buying habits. This is like me and buying memorabilia for things I like, especially plushies because I really like hugging characters I like. It is hard for me to stop and I spend so much. I have the whole Disney Store Wreck-it Ralph collection and I got Calhoun's limited edition doll because it would be weird to have 3 out for the four core (Ralph, Vanellope, Felix and Calhoun). Now I imprted the art book for Splatoon and spend a bit over 40 in U.S. dollars and while I have not been charged yet for Callie and Marie plushies but it may also be around 40 in U.S. dollars with shipping included. I had to restrain myself from getting Inkling boy and girl plushies as well but I plan to get them eventually. I need reassurance from my husband all the time it is okay and I am allowed to enjoy myself. I am not so creative with level design so was not so interested in Disney Infinity. I was only interested mainly for Ralph and Vanellope but now I am moving on to other interests that aren't Wreck-it Ralph related. I heard that a certain weapon from a certain video game series that is only marginally related to Disney was data mined and that for sure killed any interest I will ever have with Disney Infinity. So... you ask your husband to enable your bad spending? And he says yes? You call my happiness bad spending? And I do know my limits. I love how shamelessly materialistic that is. Gold star. So do you feel I would have supported Money in Japan's Splatfest? I would have went with money... before meeting the love of my life. After marriage, love all the way. After all I did choose Team Cars for my husband. I guess I have a problem after all. A must buy cute adorable plushies of my favorite characters problem. ...Well, I'm not married, so yeah I'd go with Team Money. Yes, you... got to exactly why this is a problem. I shouldn't be pitying toys. Dark Pit's staff is really interesting on the amiibo. Especially since he doesn't use the thing in the game. Oh? Why does the toy have a staff if he doesn't use it in the game? Hey, maybe they'll make a Kid Icarus Uprising 2 and have new use for these amiibo. Because his official artwork has a staff. ...but yeah he's a Pit clone and they took a very low amount of effort. Still looks cooler than regular Pit. I'm just worried that since I bought Lucario and Dark Pit, people are gonna think I'm an emo furry. XDDD Nah, they'll just think you have cool taste! Now, if you bought a Lucario body pillow, that might raise questions. Nope, no body pillows here. Just plushies. But none of my plushies are of fur. Just scales, petals, clothes, and... well there's Pikachu nevermind. Just wanted to say that Nintendo is really stepping up its game with amiibo. The Best Buy near me had the same outlook, along with a bunch of Charizard amiibo tossed in there. Hopefully this will continue and Nintendo will finally stock properly for once. Sad to say it took them THIS LONG to fix the amiibo problem. 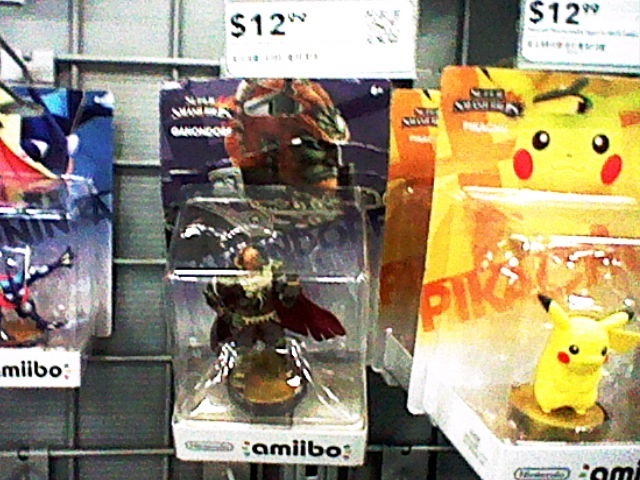 I mean, some amiibo are still really rare, but it's nice to see amiibo that were "discontinued" are now apparently plentiful to get. 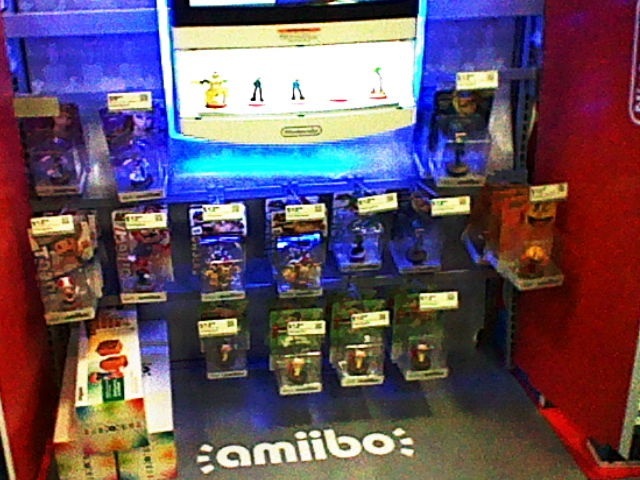 That said, not sure how much game they're stepping up if they continue to have retailer-exclusive amiibo. Well, its better than no amiibo at all. They revived Marth and Villager already, so I guess the only really rare amiibo left has to be Wii Fit Trainer. Still, I'm glad to see they're still making an effort. Well how much of an effort is having GameStop have "only at GameStop Black Friday" amiibo? And I like, Ike, dammit.